← Why Would God Love Me? Those who cling to “Judge not, that ye be not judged, ” to condemn those who expose error should read the entire chapter. Jesus said, “Beware of false prophets, which come to you in sheep’s clothing, ” (v. 15). How can we know false prophets unless we judge them by the Word of God? If we know the false prophets, how can we fail to exam the sheep of these “ravening wolves?” All through the Bible we find proof that they should be identified and exposed. False teachers are free to spread their poisonous doctrines today because there is a conspiracy of silence among many Bible believers. Wolves in sheep’s clothing are thus enabled to ravage the flock, thereby destroying many. John the Baptist called the Pharisees and Sadducees (the religious leaders of his day) “a generation of Vipers” (snakes) (Matt. 3:7). Today, he would be accused of being unloving, unkind, and unchristian. Jesus said to the religious Pharisees, “O generation of vipers, how can ye, being evil, speak good things? for out of the abundance of the heart the mouth speaketh” (Matt. 12:34). To many evangelicals and some fundamentalists, this would be unacceptable language today, but it is biblical language and it came from the mouth of the Son of God. Standing face to face with these false teachers, Jesus Christ the Son of God, called them “hypocrites”, “blind guides, ” “blind, ” “whited sepulchres, ” “serpents, ” and “ye generation of vipers” (Matt. 23:23-34). Yet, we are told today that we are to fellowship with men whose doctrines are just as unscriptural as those of the Pharisees. In our day these false teachers have come into the churches with their books, music, literature, movies, psychology, and seminars, and have turned the Father’s house into a den of thieves. It is time that men of God stand up and expose their errors for all to see. In fact, the whole Bible abounds in examples of false prophets being named and exposed. All this modem day talk about love, used as an excuse for not exposing error, is not really biblical love but is really sloppy agape. This entry was posted in Uncategorized and tagged apostasy, Bethel Church, Bible Christian Parenting, Bible Parenting, Bill Johnson, blasphemy, exposing false teachers, exposing word of faith teachers, false teachers, false teaching, false word of faith teachers, heresy, Joel Osteen, Joyce Meyer, Kris Vallotton, naming false teachers, should Christians expose false teachers, Tim Keller, Word of Faith teachers. Bookmark the permalink. Whenever we do not confront that which is false, either privately, or publicly, and in the case of ministry, the error always has to be addressed publicly, where the error was preached publicly; whenever correction is not brought, corruption is allowed to have His way. Satan is still the father of all that is false. In these perilous times, I strongly believe it is of vital importance to expose the names of every false preacher and teacher, because they are not only making a mockery of God and His Living Word, but they are also destroying innocent souls. A special web page and a International information board should be set up with a list of false preachers and teachers names and the names of their denominations. It is time that the true followers of Jesus Christ join hands and defend the Truth of God. There are too many Christians falling by the way because of false preaching and teaching, and if we have the perfect love of God, we will do what is right, and that is to drive these false preachers and teachers out for the sake of God’s Truth. For this we need to establish an active and responsible International investigation, evaluation and management Christian Body who abides strictly by the Living Word of God. This Body must then investigate and evaluate all complaints from Christians who believe that they were mislead by any form of false preaching and teaching. If found that the complaint is true, such a preacher must then be blacklisted immediately. Christians must control this increasing problem, before it gets completely out of hand. Matthew 7:1 is misused with more and more frequency. Discerning between truth and falsehood within the circles of Christianity has become a major problem. When one speaks the Truth as it should be, one is given the cold shoulder with the tongue of judgement. This is because the Truth does hurt, and there are many Christians today feel threatened by the Truth. False Prophets and teachers are rapidly on the increase, and many ignorant souls are being blinded by its deceitful ways. The avenues of falsehood are wide and deadly, and the right thing to do, is to expose these avenues with the Truth nomatter the cost. They’ll hate you for it. Prophet Nana Etrue, Bishop Nana Etrue, Etrue Appiah…These are names of 1 person who calls himself a prophet but i believe in my opinion that he is a false prophet. He is originally from Ghana but currently residing in USA. I believe he is a false prophet because he asks for money for consultation and then he asks for money for him to pray for you because he says he is a spiritual doctor and calls himself a doctor. The people that have given him money are complaining that he scammed them. Some members of his ministry have said that he sleeps with them and promise them he will marry them. His visa is expired and he is looking for whom to marry for green card.We have heard that he has a wife in Ghana but he is currently engaged to a couple of females and one of them is a lady by the name Amanda because this so called prophet is not legal in the country and he is trying to marry someone for green card. A real man of God will not marry for green card. He has a church in Arlington, Texas called Miracle house chapel international, he burned the person that helped him get a house because he doesn’t have the credit but the guy later found out that it is really because he doesn’t have the papers and documents for the house and left them in huge debt moving to Virginia to continue his scam. These are things i have found out and i have been trying to convince my friend this man is not real but she won’t believe me. Please help me because she is giving this man a lot of her hard earned money and he is lying to her, telling her he loves her and wants to be with her. He has a prayer line and so many things are not right with this man and with this ministry so i have come for your help. Please help us expose this man for the fraud that he is. On his prayer line he tells people to send him money through western union and they really do it. The prayer line no is 5597261300 and the access code is 514380. I thank GOD for Blessing me to find this site, Yes! I get excited when i read sound doctrine post. Pingback: Revival Mission » Is It Right for a Christian to Expose False Prophets and False Teaching ? I checked her out-you are right! Speaks for God out of her own inspiration and not from God’s Word. Repent, Sharon! Sherry sounds like you’ve joined yourself to lies and you’ve been deceived because nothing that you are saying is true either! Those who practice evil will always persecute the true-prophets of God like myself. But God takes wrath on all-who work evil against his prophets. (This word in II Chronicles 36:16-17, will be something you will think about for a long time now and into your future as you reap the consequences until you repent and withdraw from your false accusations). “But they mocked the messengers of God, and despised his words, and misused his prophets, until the wrath of the Lord arose against his people, till there was no remedy.” (no healing). Sharron, you are delusional and deceived. You are not a “living epistle” and you are not a “prophet”. It would probably be best to peddle your wares among your fellow reprobates. They are looking those like you who are minions of Satan to lead them. I am not. I’ve read your website posts and you are the liar-REPENT! All who are true followers of Jesus Christ must discern and expose error. But discern-er beware! Those who dare correct error will bring the wrath of Satan and and those that Satan deceives. Satan has invested years/decades/centuries of time carefully crafting minor changes by mixing small amounts of error along with sufficient amounts of truth to make it acceptable. Satan has convinced those he has deceived to believe that error is truth and Satan has promised church leaders and other to give them the things they want; more members in the church, more money in the offering plates, popularity, power, and fame. Satan convinces those who are deceived that they are not deceived and provides enough pride to those who are deceived so they reject any correction and they will follow Satan’s instruction in eliminating anyone who exposes the error and those who promote error. I was ridiculed for teaching these things. I was so ridiculed some of the leaders from the church left. We have a small congregation 20 to 30 so when the leaders left the ministry ended. I am going through having to shut down our little church. I am going back to home based church. I just want you to know this article really validated what I was teaching and of course I have the peace from the Holy Spirit that comforts me. So I just want to say thank you and God bless you. If you exposed false teaching, false doctrine and false leaders, you did what God would call a “righteous” thing. As you can see, however, there are consequences to following the God of Scripture over a man-made one. You will be persecuted. Your reward awaits you in heaven, my friend. You loved God and were obedient to Him and His Truths. You did the right thing. This is such a great article – I’ve been looking for one such as this. Thank you! Very good and sound teaching. Reblogged this on Christian Apologetics Research of Nevada. Wow, Recently I wrote my Pastor that what he was teaching was heresy and false teaching. He has begun to preach on this “silent prayer” from Psalms 46: 10 which really has nothing within its context to do with prayer. What he is teaching is known as Centering Prayer or Contemplative Prayer which boils down to a form of Eastern Meditation. Unfortunately it is hard to find a Church that does not teach this or some other form of false teaching. Of course I left the Church and he called and wanted me to come in and talk to him, which I did. He was very defensive, asking in a very sarcastic manner if I had ever heard God’s voice. He did not give me time to answer but I will say here, ” Of course I have but it was never by sitting down getting silent and seemingly demanding he talk to me at that time. God speaks to me when he decides to. He speaks to me through His Word, through other people, through circumstances and sometimes in a still small voice, but not on demand. I speak to him through talking to him and praying to Him throughout the day. He never instructed us to get still and repeat something over and over or empty our minds. When we talk to God our minds and our spirit our engaged. Why would God give us this method of prayer when he warned us in Deut. not to take on the pagan religious practices. What the Pastor is teaching is nothing but eastern meditation and Satan’s playing field which will take those who participate further and further away from the Truth and our Lord Jesus. Instead of waiting to hear my answer, he said we were done and told me what I had done was very damaging and disrespectful to him and warned me I’d be sorry if I kept spreading this stuff. So I politely left. I have to say I did feel bad most of the day. I can only figure it was because there is really no pleasure in telling someone that they are off track in order to help them ; and they then refuse to listen and go the same way as before. It is so sad that Jesus died for all and yet there will be only a remnant who will be saved. It grieves me and it must grieve the Lord. Yours is a story repeated by so many in the “visible” church. The wide gate is filled with those who have been deceived into relying on practices, philosophies and people outside of Biblical Truth. Your pastor asked you to rely on him (a fallen man) for truth…Not God. Not God’s Word. Your pastor is, as you know the wrong standard for truth. I’m guessing you live in Virginia. What towns are close by? Sorry I posted my previous post without rereading it through; but please know I realize that when I speak of our Lord as “He” , it should be capitalized out of respect. I live in what is called the Tidewater area, which is composed of Va. Beach, Norfolk, Chesapeake, and Portsmouth Va. I was living in Chesapeake for the last thirty years. A year ago,I moved back to the beach. We have the 700 club here with Regent University. I was raised Catholic, saved through the 700 club and led into the Charismatic/Pentecostal arm of the Church, until the Lord began to open my eyes to the heresy in it in about ’95. Then I attended various Non-denominational,and Baptist and Free Will Baptist churches soon discovering the heresy of the NAR, Dominonism, along with Tricky Rick Warren, leaving most of my Christian friends behind mostly because they did not think they could be deceived. Unfortunately, they had no interest in who the false prophets and teachers are the Bible was warning us about. This church looks like it may be a distance from you but you may wish to speak to them to hear their recommendations for your area. This church is a member of the American Reformed Baptist Church Association (ARBCA). My church is also a member. Sola Scriptura. No Charismania. Yes, i will contact them. It is a distance, maybe 40 miles one way, but I will contact them! Because the vast majority of Christianity prefers to be silent and hide behind the: “do no not judge others” mantra, religious cults like Mormonism and Jehovah’s Witnesses have been allowed to creep unchecked and still thriving. Now we have liberal christianity which isn’t true Christianity at all. We have these movements such as NAR and all these false preachers on TV who are still being allowed to teach doctrines of demons because Christians are asleep at the wheel or really don’t care. Hello Shepherdguardian, Who is plagiarising who? I have read exactly this same article in someone web. http://www.av1611.org/crock/judbynum.html, by E.L. Bynum. 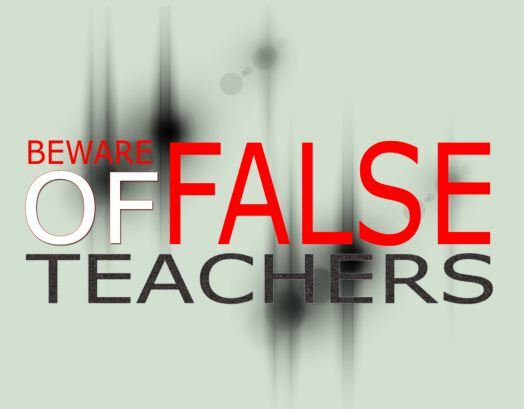 Is It Right for a Christian to Expose False Prophets and False Teaching ? who is the right author? At the end of my post, I also give a credit to the same article. My post was in 2013. I’m sure his article ( http://www.av1611.org/crock/judbynum.html by E.L. Bynum) has been oft quoted. I give credit. I do not plagiarize. Thank you for your comment.